There is a longer interview at Carbon Brief which rewards reading. She’s one of the most informed, balanced and insightful climate scientists I’ve come across. How she got into climate science is worth relating. the second thing I learned was that climate change is such an urgent problem – because up until that point I viewed climate change as one of a suite of important environmental problems: air pollution, water pollution, biodiversity loss, climate change. But I did not realise that climate change is, as the military now puts it, a “threat multiplier” that is exacerbating all of those other issues to the point where we are not going to be able to fix any of those other issues if we leave climate change out of the picture. Not only that, but climate change is exacerbating humanitarian issues, as well – hunger, poverty, lack of access to clean water – it’s exacerbating these, too. She’s a devout evangelical Christian, so when you see bad stuff that is important and urgent, you fix it. So she thought that she would work on climate science modelling in graduate school, fix it, then go back to astrophysics. A couple of decades later, she’s still fixing it, with no end in sight. Essentially there is no computer big enough to completely model climate. I work with people on the ground who want this information to put into water management models, to put into crop yield models, to put into models of how humans respond to extreme heat conditions and what impact that would have on our health. It fascinates me because we’re actually putting this information to practical use to help real people, and that’s why I decided to study climate change. an authoritative assessment of the science of climate change, with a focus on the United States. It represents the first of two volumes of the Fourth National Climate Assessment, mandated by the Global Change Research Act of 1990. So, published in 2017, it is at least four years more up to date than the latest IPCC report. She is critical of the IPCC process, which she says was suitable as a process when it began in the early 1990s. Now it ensures that most of the time policy makers are using out of date information. 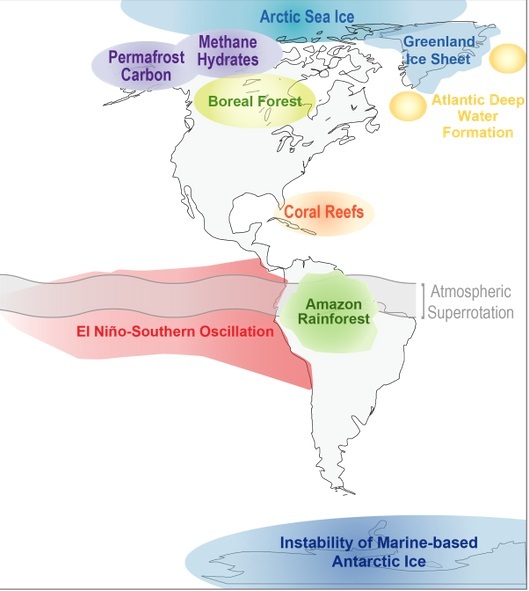 I have not myself had time to digest her report, but she is keenest on the last chapter Chapter 15: Potential Surprises: Compound Extremes and Tipping Elements which seeks to identify where the future may surprise us, the known unknowns, if you like. Some areas are susceptible to multiple types of extreme events that can occur simultaneously. For example, certain regions are susceptible to both flooding from coastal storms and riverine flooding from snow melt, and a compound event would be the occurrence of both simultaneously. Compound events can also result from shared forcing factors, including natural cycles like the El Niño–Southern Oscillation (ENSO); large-scale circulation patterns, such as the ridge observed during the 2011–2017 California drought (e.g., Swain et al. 2016 ; see also Ch. 8: Droughts, Floods, and Wildfires); or relatively greater regional sensitivity to global change, as may occur in “hot spots” such as the western United States. Finally, compound events can result from mutually reinforcing cycles between individual events, such as the relationship between drought and heat, linked through soil moisture and evaporation, in water-limited areas. The report identifies some possibilities, but there can be new compound events not yet revealed – the unknown unknowns. Plausible physical modeling indicates that, under the higher RCP8.5 scenario, Antarctic ice could contribute 3.3 feet (1 m) or more to global mean sea level over the remainder of this century, with some authors arguing that rates of change could be even faster. The RCP8.5 scenario, roughly speaking, represents business as usual. With the rate of increase of CO2 emissions itself increasing this may be where we are heading if we don’t mend our ways, which I’m sure we will. However, it may not be soon enough for a safe climate. Can we meet the 1.5°C target? It is still technically possible, but if we continue on our current emission rates for more than a decade or so, we will not be able to meet 1.5°C without substantial deployment of technology to remove CO2 from the atmosphere. On Trump, she says the effect has been to make others redouble their efforts, for example states and cities. Ironically, we may achieve more during the Trump presidency than we otherwise would have as a result of Trump’s actions. There’s plenty of debates – genuine debates – in the climate science field, but there is no legitimate debate over whether climate is changing and humans are responsible because, as the Climate Science Special Report says, there is no alternative explanation for the warming. If you look at natural factors, every single natural factor either says there will be no change or we should actually be cooling right now. If we look at the sun, if we look at volcanoes, if we look at orbital forcing, and if we look at natural cycles, none of them can explain the warming. In fact, we should actually be getting cooler today. 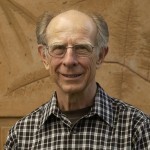 What comes through to me is that if you want to deny that the climate is changing, or accept change but deny human causation, you have to believe that temperature measurements are being systematically ‘fixed’ and the scientists are either in a conscious dishonest conspiracy or a giant group think. 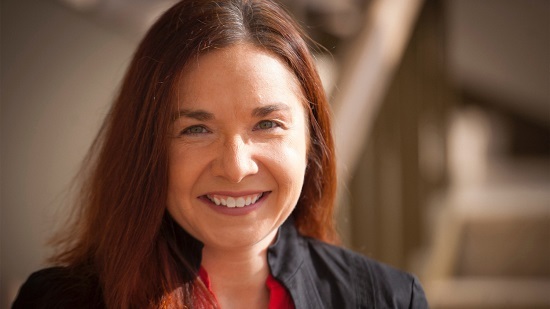 It’s hard to fit scientists like Katherine Hayhoe into that mould. In the book of Genesis, God entrusts humans with responsibility over all living things on Earth. Throughout the New Testament, we are repeatedly reminded to love others as we have been loved by God, and to particularly care for those who are poor and already vulnerable. Today, climate change disproportionately harms those people. Many Christians in the US are told they don’t need to worry about climate change. Political evangelicals, as I call them, cherry-pick verses from the Bible and use them out of context to craft an unchristian theology of indifference – even hostility – to climate change. They argue, for example, that the world will end anyways, so why not hasten the process? In the book of Revelation, however, we are told that God will destroy those who destroy the Earth. And the apostle Paul wrote to those passively waiting for Jesus to return to remind them that, although we don’t know when the world will end, they had plenty of work to do in the meantime, to support their families and care for widows and orphans. When I speak at churches and Christian universities, these are the types of messages I try to underline. Her response, when people talk about sun spots? Firstly, she says, don’t you think I would have thought about that in the last 20 plus years of studying climate science? I want to share not just my head with people, but also my heart. only 35 per cent of white evangelicals and 41 per cent of white Catholics were concerned about climate change. In comparison, 58 per cent of black Protestants and 73 per cent of Hispanic Catholics were concerned. 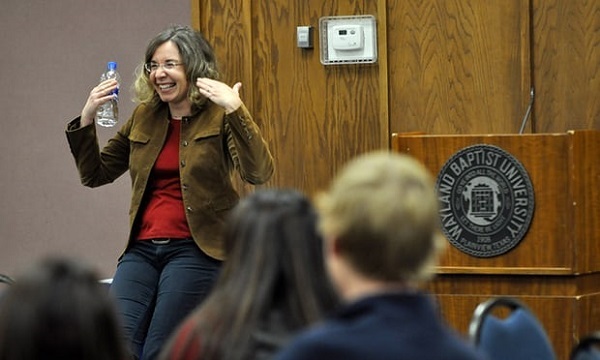 However Katharine Hayhoe is having some success in convincing doubtful evangelicals about climate change. She spends some time when addressing evangelicals examining the difference between faith and science and uses the ‘trusted source’ approach. Meanwhile back at the farm the Coalsheviks have broken out of their paddock again. Minister Matt Canavan has written to the heads of Japan Oil, Gas and Metals National Corporation and the director of the coal division of Japan’s Ministry of Economy, Trade and Industry inviting them to invest in building coal-fired power in Australia. Apparently the postal service is so lousy he had to send maverick Nationals MP George Christensen to deliver the letters personally, with the trip funded by coal interests. I’m not sure big George C would help to convince anyone of anything. Minister Matt Canavan has written to the heads of Japan Oil, Gas and Metals National Corporation and the director of the coal division of Japan’s Ministry of Economy, Trade and Industry inviting them to invest in building coal-fired power in Australia. It seems Canavan has his eyes/ears closed to compelling arguments against supporting coal, and exposing Australia’s reputation to ridicule. Perhaps Canavan should be focusing on the cheaper renewables (ie. PHES, wind, solar-PV, and solar thermal with storage), instead of spruiking the more expensive new HELE coal technology? Carbon Brief has a media analysis of the reporting of this year’s northern-hemisphere summer that has seen a succession of heatwaves take hold in Europe, Asia, North America and northern Africa. I wonder how much longer it will take for the deniers (and ‘skeptics’) of human-induced climate change science to concede they got it wrong? That seems in direct contradiction to Senator Canavan’s letter reportedly saying world demand for coal is growing, especially in Asia which is supplied by Australia. It seems the appetite for new coal investments is quickly disappearing – the Coalsheviks haven’t wised up to it yet. Glad to see Katharine Hayhoe is right onto the political evangelicals – whom I equate with the Wahhabists in Islam and with the dishonourable knights and the robber barons of the unholy Crusades. These are the same fake Christians who commanded “strip-mining for Jesus” in the Reagan era and who are now unsure whether it is The Cross at which they worship or their collection of hand-artillery and semi (for the moment)- automatic assault rifles. Of course they will hate her with a fury. They know too damned well that the Holy Bible urges them to responsible stewardship of God’s gifts, as she has rightly pointed out – and they know that there ain’t no tax-free profits in that. Hayhoe makes the point that many Christians are particularly un-Christian in what they say to her and wish for her. But they don’t do it to her face. It shouldn’t be surprising that the Evangelicals are reluctant to accept ideas that are based on science. The Evangelicals have had a history of conflict with science in areas such as evolution vs creationism. They may also be uncomfortable with a scientific method that can only disprove but never 100% prove. Most of us crave certainty to some extent. The difference between us and the Evangelicals may simply be about what “certainties” we use to keep us comfortable. We also have problems with the way climate change has been accepted/rejected by different political parties. It is funny how the Jesuits, who got off to a really bad start, (murderous intolerance, ruthlessly enforced group-think – and worse). Yet within a couple of centuries, they changed themselves so that they embraced the scientific method and all the glories and uncertainties and mysteries of God’s wonderful universe. They showed, to the discomfort of some atheists, that Science and Faith are not necessarily enemies but can indeed complement one another. So what gives with the American Evangelicals? Are they so arrogant as to reject knowledge of God’s magnificent universe ? Their behaviour, in recent years, suggests that they have abandoned God – despite all their public praying, Bible reading and hymn-singing – and, instead, are now worshippers of Mammon and praisers of the Almighty Dollar.